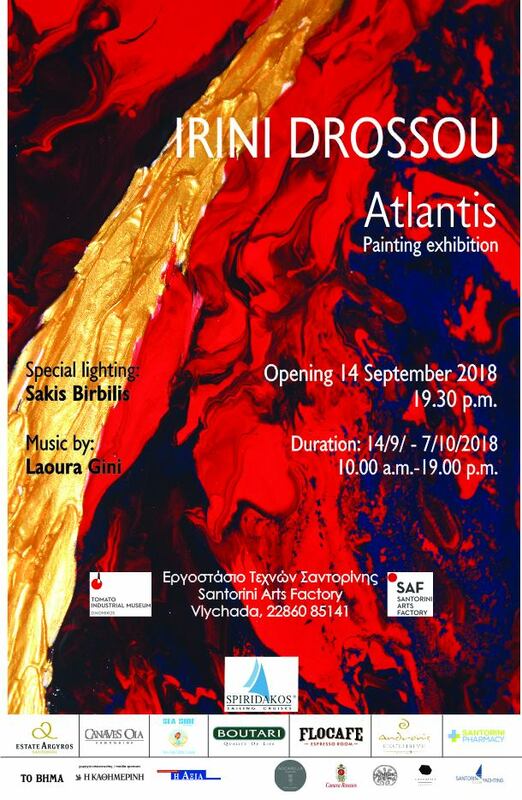 The Santorini Arts Factory (SAF) in Vlychada proudly presents the exhibition of Aerienirti-Irini Drossou, called ”ATLANTIS”. ‘ATLANTIS’ myth or today’s reality? A past that insists on the future and demands to become reality. Inconceivable its beauty, shakes its intransigence. Through the evolution of technology, our present appears minuscule on its chaos. The thought, the fantasy, the art as the initial core of the cosmic time, unites the myth and the reality through this exhibition which shows lava materials, volcano ashes and colours, and joins them to penetrate the far end of the inner self’s explosion. This visual arts fair coexists interactively, with music specifically composed for this theme by composer Laoura Gini and with special lighting from Sakis Birbilis, a theatrical designer of lighting and illustrations. The quest of the relationship of music, light and colour in a visual approach, creates meanings that express the past, the present and the future, revealing the secret and nature’s character, by receiving and giving a divine message.